The relationship between Cambridge and Le Quesnoy has it origins in the small fortified french town's liberation one week before the end of the First World War by the New Zealand Division. The orders for the attack on the German defences for the 4th of November stated that Le Quesnoy was not to be attacked but encircled. It was after achieving their objectives that the 3rd New Zealand (Rifle) Brigade liberated the town. The final inner wall of the towns defences presented quite a challenge. With the only remaining ladder the 4th Battalion managed to get troops over the wall and open one of the town gates. Troops flooded in and the town was liberated after more than four years of occupation. The first soldier on the inner wall was a young Cantabrian 2nd Lt Leslie Averill who as a battalion intelligence officer had a part in finding the scaleable part of the wall. He was later to have a distinguish medical career. 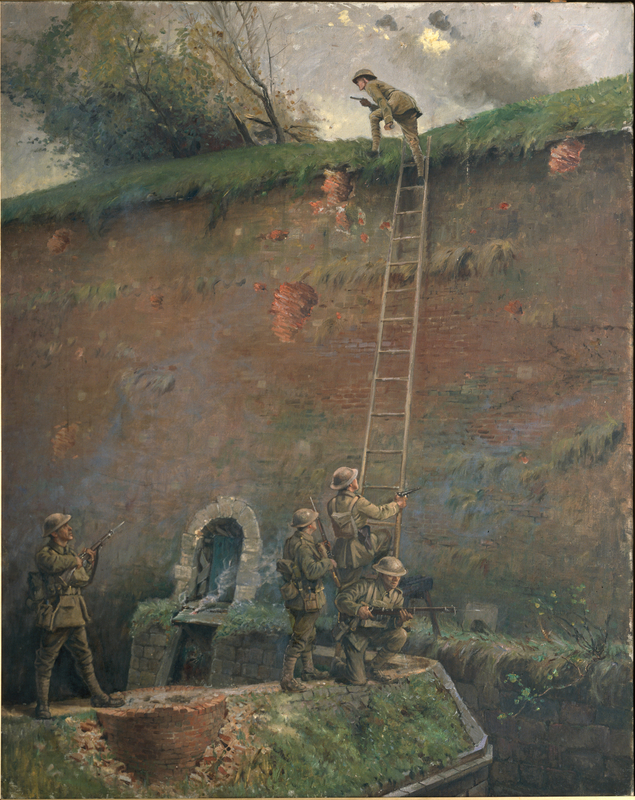 The New Zealand Division's last significant battle of the First World War was well planned and executed resulting in minimal casulties and damage to the old fortified town of Le Quesnoy. There was no artillery bombardment of the town and no civilian casualties in it. All the objectives were achieved. It left a lasting impression on the people of Le Quesnoy for the soldiers who came from the "ends of the earth". ANZAC day is commemorated in the town each year, streets and a school were named in their liberators' honour. There was at least one soldier from Cambridge who participated in the action that day. He was an army chaplain, Clive Mortimer Jones, who enlisted while the vicar of St Andrews Anglican Church in Cambridge and returned to be its vicar on his discharge. He was a prolific letter writer who wrote regularly to his old parish while serving in the army. His letters were widely circulated in Cambridge which at that time had a population of scarcely 1500. World War One memorial window. St Andrews Anglican Church, Cambridge. In the 1920's, the now Mortimer-Jones successfully proposed the installation of a set of three commemorative stain glass windows in St Andrews Church, one of which commemorates Le Quesnoy's liberation. The windows were unveiled on the same day as the dedication of a plague in Le Quesnoy to the town's liberation by the New Zealanders. The Waikato was still part of the Auckland Diocese and the vicar was a supporter of Cambridge becoming a seat of a new Waikato/Taranaki Diocese. At the time the Bishop of Wiapu was none other than the young 2nd Lt Averill's father Alfred Averill. The family connection was further enhanced when another of the bishop's sons, Walter, on his ordination became curate at St Andrews. Alfred Averill became Archbishop of New Zealand in 1925 and despite Cambridge's best endeavours the Waikato seat of the new diocese went to Hamilton's Parish Church of St Peter in 1926. Mortimer-Jones left Cambridge for Hastings in 1927, was vicar at several other North Island towns and in his late seventies retired to Cambridge before dying in 1965. In the 1990s there was a renewed interest in the relationship between Cambridge and Le Quesnoy resulting in them becoming sister cities in 1999. Amongst the proponents was the then vicar of St Andrews Church and one of the few surviving soldiers from the New Zealand Division's attack on the 4th of November 1918. Lawrence 'Curly' Maurice Blyth was another Cantabrian who lied about his age to join the army while a farm hand at Waipukurau. By the battle to liberate Le Quesnoy he had been commissioned as a lieutenant and was that day in charge of a company of soldiers. He was later to attain the rank of Lt Colonel in the home army during the Second World War. He died at the age of 105 and his ashes are buried at St Andrews Church in Cambridge. The relationship has grown with regular exchanges and visits between the peoples of the two towns. Each Rememberance Sunday (the closest Sunday to Armistice day the 11th of November), Cambridge holds its own Armistice Service. Le Quesnoy has a welcoming visitor centre for New Zealanders and continues its tradition of holding ANZAC services started after the First World War. On the centennial anniversay of the town's liberation a New Zealand War Memorial Museum was openned in Le Quesnoy dedicated to all New Zealanders who have fought in Europe.